Chimamanda Ngozi Adichie is undoubtedly one of the most engaging literary figures to have burst onto the world’s literary landscape in recent times. Her writing has introduced new motifs and narrative styles which have invigorated contemporary African fiction as well as posed challenges to the multicultural nature of our modern life. Adichie’s first novel, Purple Hibiscus (2003) launched the writer as a serious commentator of human relationships and a notable new voice. Purple Hibiscus is a multidimensional novel set in the Igbo region of Nigeria and deals with issues related to celibacy in the Catholic priesthood, the legitimacy of traditional Igbo religion and the resilience of a citizenry faced with political instability and the acute poverty in a wealth nation. The novel was followed a few years later by Half of a Yellow Sun (2006), one of the most important fictions written about the Nigeria-Biafra war (1967-1970). Numerous works of fiction, faction and biography, including drama and poetry, have been written on the war by popular Nigerian writers and historians such as Elechi Amadi (Sunset in Biafra: A Civil War Diary, 1973); Wole Soyinka (The Man Died (1972), Madmen and Specialists (1970), Season of Anomy (1973), and Poems from Prison (1969; republished as A Shuttle in the Crypt, 1972)); Chinua Achebe (Beware, Soul-Brother, and Other Poems (1971), Girls at War and Other Stories (1973)); Cyprian Ekwensi (Survive the Peace (1976), Divided We Stand: a Novel of the Nigerian Civil War (1980)); and Ken Saro-Wiwa (Sozaboy: A Novel in Rotten English (1985)). Adichie lists thirty-nine similar texts as being influential to her writing Half of a Yellow Sun. However, none of the texts on the list had been written by someone who was not directly involved in the war. Adichie’s Yellow Sun is therefore unique in the sense that it was written by someone who was not involved in the war. In fact, Adichie was not born until 1977, seven years after the end of the war, yet Half of a Yellow Sun exposes the pathos and anguish of the period in a refreshing way. Her latest novel, Americanah (2013), ‘blends ingenious craftsmanship with extravagant and versatile innovations’ (Intro, p. 1) and probably inspired the compilation of a Companion to examine and expatiate the writing of this important writer. 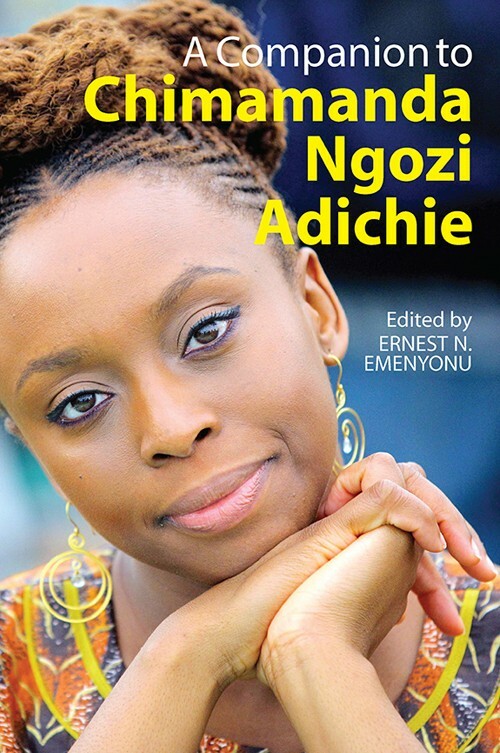 A Companion to Chimamanda Ngozi Adichie, edited by Ernest N. Emenyonu, is an attempt to ‘examine, explore, and analyse the ramifications of Adichie’s creative outputs from a variety of perspectives that demonstrates a thorough understanding of her art, ideology, and vision as writer’ (p. 4). Explaining the initiative for the Companion, the editor hinges it on an attempt to complete ‘unfinished conversations’ between Adichie and participants at the “Renowned African Writers / African and African Diaspora Artists Visit Series”, a forum organised in September 2014 at the University of Michigan-Flint, USA as a collaborative project of the Department of Africana Studies and the Flint Public Library to specifically discuss the writer’s work. The Companion is composed of seventeen research essays, plus an Introduction by Emenyonu. Despite the wide scope and depth of the discourse presented in the essays, the organisation is simple, with the chapters arranged to address Adichie’s works in the chronological order of the publications to date, beginning with Purple Hibiscus and ending with Americanah. There are six chapters devoted to Purple Hibiscus; four on Half of a Yellow Sun; two on The Thing Around Your Neck (2009); with the last four chapters on Americanah. Apart from the Introduction, there is a ‘lead’ essay by Louisa Uchum Egbunike, which tries to define the ideological premise of Adichie’s writing. In “Narrating the Past: Orality, History & the Production of Knowledge in the Works of Chimamanda Ngozi Adichie” (pp. 15-29), Egbunike outlines the Igbo worldview out of which Adichie emerges and which informs and influences her writing. This first chapter is important in understanding Adichie’s novels as well as the discourse in the other chapters because it identifies aspects of the Igbo oral tradition and history from which Adichie draws her literary vision and inspiration. Though this chapter is introduced as authenticating the originality of Adichie’s narrative forms and techniques, this is a speculative assertion as the chapter in fact invokes and affirms the indebtedness of Adichie to Igbo oral forms and narrative techniques popularised by writers such as Chinua Achebe. Egbunike refers to overt intertextual references between Achebe’s Things Fall Apart (1959) and Adichie’s The Thing Around Your Neck (2009) (p. 23), especially the short story “The Headstrong Historian”, which she remarks as bearing a striking resemblance to [that of] Things Fall Apart, and which deals with subjects connected to the Purple Hibiscus (pp. 23-24). This chapter therefore expands the vista through which we not only view Adichie’s work, but through which we can evaluate the other chapters. Egbunike helps in this by locating Adichie’s literature within a long tradition of Igbo literary cultural production (p. 28), and connected to modern fiction of Chinua Achebe, among others. The six chapters on Purple Hibiscus focus on various critical perspectives on the novel. Janet Ndula in “Deconstructing Binary Oppositions of Gender in Purple Hibiscus: A Review of Religious / Traditional Superiority & Silence” (pp. 31-43) hints at the novel as the establishment of Adichie’s brand of feminism which she adumbrated in her pamphlet, We Should All Be Feminists (2014). Ndula is of the view that Purple Hibiscus endorses individual efforts over gender dispositions or aspirations, and that validating gender and gender-based constructions end in dislodging the hierarchies so constructed, therefore transforming unequal societal structures into recognised equality. This summary encapsulates the direction of the argument in the remaining five essays and adequately points at the importance of Motherhood in the face of stark, unyielding masculinity, as explored in Iniobong I. Uko’s “Reconstructing Motherhood: A Mutative Reality in Purple Hibiscus” (pp. 57-71). The chapters on Half of a Yellow Sun explore and examine the Nigeria-Biafra war of 1967-1970 more than they do Adichie’s intertextual narrative on the war. Understandably, this is a relevant thrust for several reasons: Adichie’s novel is a fiction based on oral and literary narratives about the war and therefore needs to be contextualised in the discourse. Further, the intertextual relationship of Adichie’s novel to the war deserves precise complications to provide a basis for a deep discourse on Half of a Yellow Sun. Emenyonu in his Introduction to the Companion asserts that the ‘great Nigerian novel’ on the war did not exist before Adichie because earlier writers could not ‘detach themselves enough to bring their imaginative vision to bear’ (p. 7) on the event. However, this statement does not properly consider the immense contributions of Cyprian Ekwensi, especially in Survive the Peace, or the works of Buchi Emecheta among others. Adichie’s novel may have been nouveau by being one of the first to be written as a popular fiction – this excludes the dramas of Chukwuma Okoye, Dele Oladeji and John Iwuh – by someone not involved in the war, but it is a novel that exists upon the imaginative construct of the thirty one texts listed at the end of the novel, and more importantly, on the recollections of Adichie’s parents. This is not denying the position of the novel in recuperating the events of the war, but it is yet another in recent works on the war, and the essays in this collection underline that. As the four contributors on Half of a Yellow Sun agree, Adichie’s contribution is important because it prods the collective amnesia on the Nigerian political stage about the war, history of which is neither memorialised in public discourse or taught in schools. More particularly, as the contributors impress on us, especially Pauline Dodgson-Katiyo (“‘Fragile Negotiations’: Olanna’s Melancholia in Half of a Yellow Sun”, pp. 115-127) and Chikwendu Paschalkizito Anyanwu (“Corruption in Post-Independence Politics: Half of a Yellow Sun as a Reflection of A Man of the People”, pp. 139-151), Adichie’s focus on characters and characterisation, historical importance of the war, intertextual engagement, and representation of gender imbues a special relevance to the work, and makes this Companion a necessary reader. The tact changes with the contributions on Americanah. The essays in this section of the Companion interrogate Adichie’s notion of mobility and migration as they apply to women, and how the sense of location and dislocation is not dependent on physical territoriality but could be more universally placed and identified with gender oppression, mental imperative and psychological attitude. In support of Adichie’s idea of feminism, which espouses harmonious mutual relationships across genders as a means to creating a better world, with relationships defined along capabilities, Gichingiri Ndigirigi (in “‘Reverse Appropriations’ & Transplantation in Americanah, pp. 199-211) concludes that deterritorialized females with ‘flexible citizenship’ (p. 207) emerge as autonomous ‘objects of appropriation’ (p. 211) able to traverse traditional cultures and borders. In several interviews, including her 2012 TEDxEuston Talk (later published as We Should All Be Feminists, 2014) and lately as a guest at the annual La Nuit Des Idees (A Night of Ideas), hosted by the French government in January 2018, Adichie re-members her hairstyle and the position of maintaining that style as she wants, as an emblem of feminine independence, and a symbol of created identity. The last chapter in this book, “‘Hairitage’ Matters: Transpositioning & the Third Wave Hair Movement in ‘Hair’, Imitation & Americanah” by Cristina Cruz-Guthiérrez (pp. 245-261), recuperates this point and contextualises Adichie’s hair as a representation of personal and political identity, self-perception and ‘a sign of black women rejecting previously internalized discourses of normalized femininity and appearance’ (pp. 253, 258); and transforming the women’s identities from a position of controlled submissiveness to that of empowerment. The essays in this Companion informatively present Chimamanda Ngozi Adichie’s artistic vision, ideology, and intertextual engagement. Helpfully for those not very familiar with the work by or the writing of Adichie’s, the Companion concludes with an appendix of her works between 2004 and 2016, compiled by Daria Tunca (pp. 263-290), with a listing of nine books and key references, forty four short stories, ninety three essays and lectures, one hundred and eighty four interviews, and more than sixty other sources and resources that provide further insight into the writing of this important literary voice. With her rising profile and importance as one of the major world writers, this Companion on Adichie could not have come at a better time.